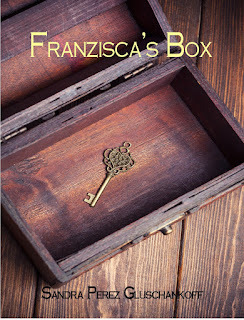 The Latina Book Club congratulates author Sandra Perez Gluschankoff on the debut of her second novel, FRANZISCA’S BOX. It's out today!! And, we are pleased to be able to share this excerpt with our readers. BOOK SUMMARY: Mystery, betrayal, murder, and passionate love were things Sofia Lazar only experienced as a movie producer. All of that changed after her grandmother’s sudden death when she comes face to face with an unwanted revelation contained in a tattered box. The meager contents of the box take her back to her childhood and the fantastic bedtime stories that Abuela, her grandmother, used to tell her of a heroic warrior girl named Franzisca. Now, two decades later, fragments of Franzisca’s stories creep back into Sofia’s life, tying Franzisca and her grandmother to an unknown past. With the memories of her childhood bedtime stories to guide her, Sofia sets out to piece together her grandmother's mysterious history leading her to discover the truth behind her life. The fateful news delivered by the voice of my estranged mother chased me all the way back to the home I had shared with Abuela, my grandmother, for the past twenty years. I had always entered the house through the garage and continued straight into the kitchen where the scent of a freshly baked pie, dark Turkish coffee along with the warm embrace of my grandmother awaited me. A rising fear of confronting the empty kitchen devoid of its familiar scents and its elegant hostess gave me pause. I felt like a coward, guilty for having let her die alone. I stepped down off the porch and filled my lungs with fresh air, taking in the beauty of the place we had called home. I turned to take a look at the hills sprouting with new green and yellow plant life and I was filled with happy memories. Abuela had loved this place and it was here where she had taught me to see the intricate magic of nature. This was the best time of the year, when the dead moldering vegetation of winter dissolved back into the ground, giving way to tender, sweet pastures that readied themselves to welcome the spring does and their fawns. I laughed inwardly at the irony of the scenery in front of me. I was witnessing life at its pinnacle, while death, my abuela’s death, was what had brought me back to face it. The short walk around the property grounds led me up to the front steps of the house. There was no use in delaying the inevitable any longer, so gathering strength I did not feel, I pushed the key into the lock before the enormity of the task ahead would send me reeling back into the shelter of the open fields. My footsteps echoed through the silent house, making me feel like a trespasser. The objects Abuela had carefully selected to become part of her fortress now glowered at me for interrupting their mourning. I was not the only one feeling empty. This home, the place she had reigned, had lost its queen. I followed the yellow glow of light that emanated from Abuela’s study. For the past two decades, the warm glow of her brass lamp had become a testament to her solid presence, acting as a beacon, a safe path to her, and to her love. I hesitated at the study’s threshold, but the familiar light lured me in. Always the optimist, I glanced around the room and met the grieving silence along with Abuela’s empty leather recliner with a feeling of disbelief. The cream chiffon drapes that framed the windows were drawn, rejecting the intrusion of natural light and the view of her favorite alpine roses. The cord connecting Abuela’s old-fashioned, black rotary phone to its jack lay unplugged on the wood floor, reluctant to receive calls. Gone was the pile of pending files that she kept on top of her sixteenth-century, Spanish, cherry-wood desk, as if she had attended to the last of their details before she saw fit to stash them away. Everything around her study lay in a state of disturbing order. And everything pointed to an intruder placed in the center of her large desk. It was an unfamiliar letter-sized box that immediately stole all of my attention. The box was made of wood, clearly weathered by the passing of time and splotched with water stains around the edges. A sheet of Abuela’s personalized stationary, folded in half, rested atop the box with my name scrawled across it. The brass desk-lamp stood strategically poised over the tattered container, its golden light illuminating the box, leaving no doubt that she had staged its delivery. All this mystery around a beat-up box made no sense, such as my last conversation with Abuela had made no sense to me at all at the time. Roughly twenty-four-hours ago, my day had started like any other ordinary day since we began filming what I secretly called, The Italian Nightmare. With only four hours of sleep and legs hairier than Jane of the Jungle, I woke up that morning in Siena, Italy, wishing for the movie I was currently producing to be over and done with so I could fly back home to Solvang, California. With the flavor of the rosemary-raisin bun I had eaten earlier that morning still lingering in my mouth I pondered over the one commitment awaiting me in Solvang: Breakfast with Abuela at her favorite pancake house. I lifted my eyes from my laptop to find my assistant waving my ringing cell phone in the air. She did not say who the caller was. I knew the call was from Abuela. No one ever called me on that number while I was working on location, but general rules did not apply to her. Still, she had never called me in the middle of the day. Abuela had been everything to me; grandmother, mother, teacher, friend. Ours was a relationship in which unspoken love said more than any of the secrets she had never shared with me. 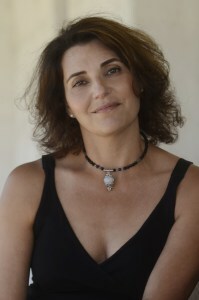 Even at a distance, when my career had taken me away, we had always stayed connected. She was my last phone call before going to sleep regardless of which time zone I was in at that time. As much as I tried to argue against disrupting her sleeping pattern, she would not have it any other way. With still twelve hours to go to our next phone call, I had found this mid-morning communication uncharacteristically strange. For the first time in thirty years, without preambles, she dove straight into a subject we tended to skirt around. THANK YOU AND CONGRATULATIONS AGAIN, SANDRA!